I love the grilled corn salad. I just prepared for lunch and we loved it. Plato limpio ! Espero que mi esposa quiera hacer esta ensalada con el pollo conmigo esta noche. Vi este programa anoche con mi hija (tiene 4 anos y le encanta su programa) y sabia que tuve que prepararla. Combina ingredientes distintos y sabrosos con mucha cultura, y siempre disfruto los episodios. Gracias por lo que hace. Good salad. For a little change up, try peppadews in place of the tomatoes next time, but don’t saute them. They add a little more sweetness than the tomatoes. So glad you are making this recipe your own, Joseph! Thank you so much for the grilled corn salad recipe. I watched you prepare it on your show and it looked so delicious( I watched it twice)! I can’t wait to try it. I’ll let you know. Hope you love it, Fran! Easy to prepare this dish but tastes like you spent hours bringing out all the flavors! It was a big hit with the family. Yay!! So glad it was a big hit, Mario. This came out beautifully! I decreased olive oil to 2tbs to save calories and added a clove of minced garlic to tomatoes during last two minutes of cooking. I also added about a cup of steamed green beans to the salad to round out the nutritional value. Yummy! I’m so glad you made it your own and enjoyed it, Joanna! loved the salad and it went great with the oregano garlic chicken! I saw this recipe on the PBS marathon this morning. My novio says “c’mon, we will be late for hiking!” But I just had to get this recipe so that I can make it tomorrow. Hahaha! I hope you and your novio enjoyed the salad…and the hike :). This is insanely delicious! Thanks Pati! 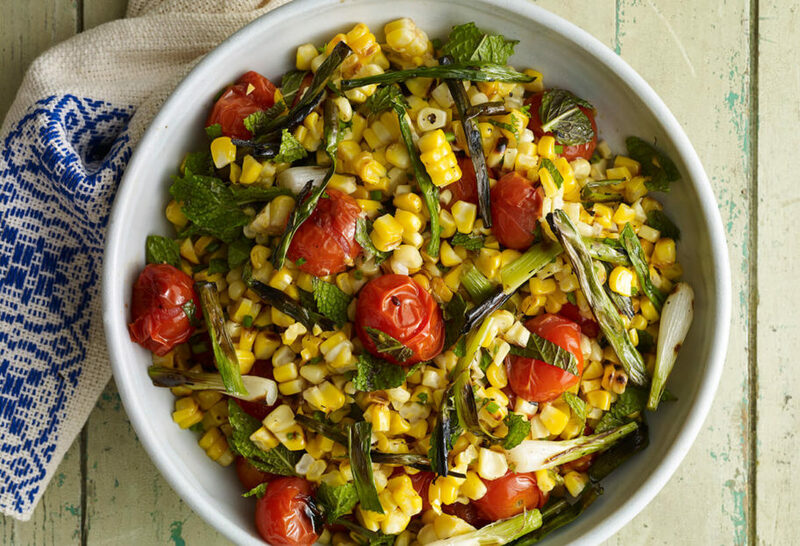 All the flavors come together with a sweet and savory combination happening with the carmelized corn, green onion, mint, vinegar, and tangy sauteed tomatoes. I was nervous the mint would be strong, but it blends with all ingredients perfectly. My family who does not, let’s say, “appreciate” veggies cleared the bowl! I used 8 ears of corn, and half a box of red tomoatoes. If you cut the corn off the cobb (I did 25 minutes on stove top in non-stick griddle), you can add it back to the pan for about 5 minutes or more if it I hasn’t cooked enough. Can’t wait to make this again! So happy your whole family loved it!